To celebrate all of the hard work the kids put in doing homework this summer, the Eliot had a dance party. It was super cute! All of the kids walked down to the water and danced. It is so funny how easy it is to please kids sometimes. What a way to celebrate! On the water, on a beautiful day with your friends. It was really a pretty brilliant, no cost, healthy idea. 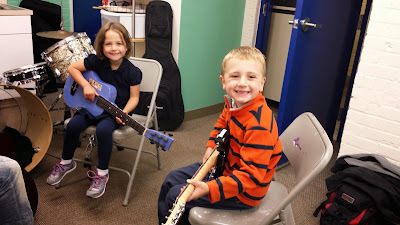 My kids are lucky enough to have private guitar lessons since no other kids signed up for Thursday mornings. The kids love Morgan (their teacher) and I love NEMPAC (North End Music and Performing Arts Center) because they provide affordable music lessons. Real private lessons would be almost twice the price. I wonder how long they will let us keep this gig?! Tooth number 2 is out! Tooth number 2 is out. 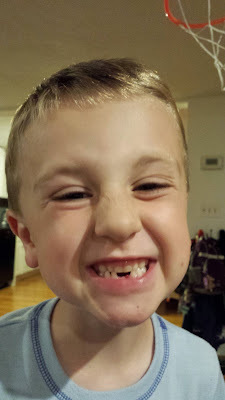 I don't plan to write about every tooth the kids lose, but this one was funny! It has been bothering Rich for a few days now making it hard to eat, etc. He was just begging me to pull it out for him. Ah, yeah....NO thanks! I let mine dangle till gravity worked its magic when I was a kid so I am not about to pull his out. But Daddy to the rescue and bam, it is out. So glad he isn't like me and doesn't wait for it to dangle. And so glad Chris is the one to pull. Now...just need to start remembering to play the tooth fairy at NIGHT and put the money under his pillow BEFORE he wakes up the next morning! Sigh....parenthood. 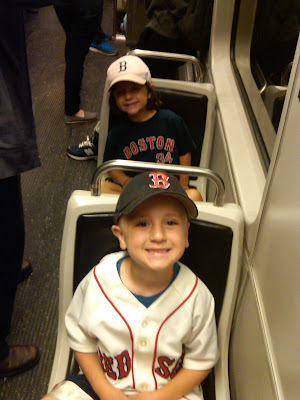 Another Red Sox game, but this time we had "good seats"! Chris won these seats at a golf tournament and it was exciting because our normal seats are way out in the bleachers. 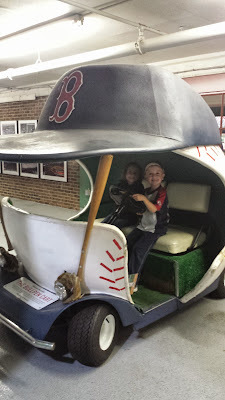 Had a blast being in a different part of the ball park. Love bumping into cool things going on in the city. 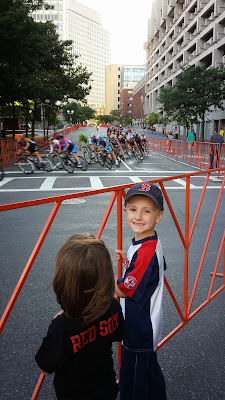 This was the Mayors Cup bike race. Pretty cool to watch these professional/semi-professional bikers cruise around Government Center at ridiculously fast speeds. 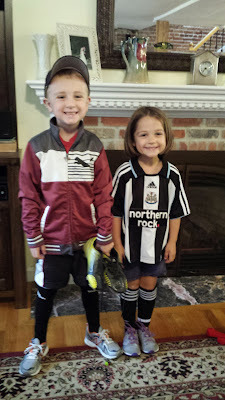 It is that time of year.....falls means soccer! And now I have to spend the whole morning down at the ball fields because I have two soccer players. Angela had a blast and of course got out there and ran her little heart out. She was so proud to have lots of friends on her team (Charlie pictured) and to have Coach Dada! Rich thinks he is just an old hat at these things. He "helped" Chris coach Angela's team and then his smile got bigger when it was his turn to play. Very proud of team Italy and team USA and their first week wins. I pray it stays as nice and warm as this week. Now that I have a few hours to myself on Fridays (when both of the kids are at school), Regina and I have enjoyed some special time together. 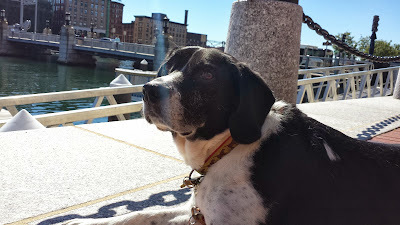 Long walks....sitting along the water.....quietly! 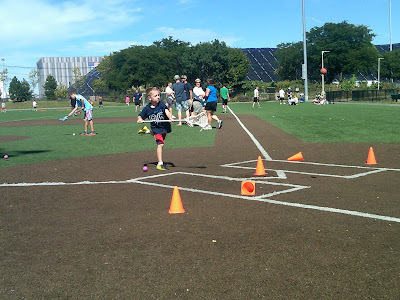 My sports fanatic wants to try EVERY sport out there so this season it is lacrosse. We shall see how it goes. If he likes it, I guess we are buying equipment and spending our weekends at the lacrosse field this spring. Another Red Sox game although I had to miss this one because I was away. Kids had such a fun time, Angela passed out on the couch when she got home (and this one will NOT nap willingly any more)! Do you see that smile? 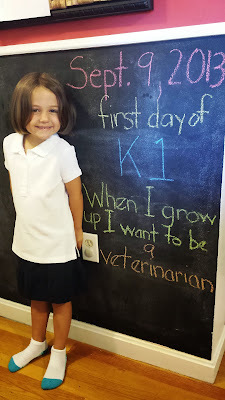 She smiled the ENTIRE day on her first day of school. Crying kids everywhere, not Angela! She was so ready and so happy to go to school. I could not be more proud of her which made me cry most of the day. My baby is a big school girl. Tears roll every time I think of it! Angela picked buffalo wings for her first day of school dinner! The wedding weekend of Lindsey and Frank's was nothing less than perfect! Not sure there is much to say about it. Angela and the other kids looked adorable and did an amazing job. 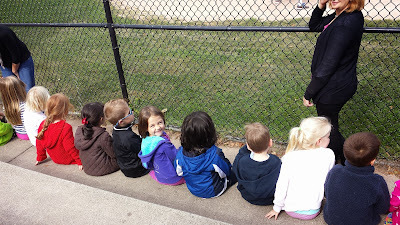 There were so many cousins to play with, the time went by too quickly. 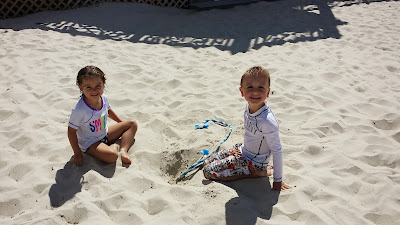 AND we got an extra beach day at LBC, which is one of my kids favorite places on earth. Thank you for an amazing weekend, Lindsey, Frank, Aunt DonnaJo and Uncle Hutch! Congratulations and much love!